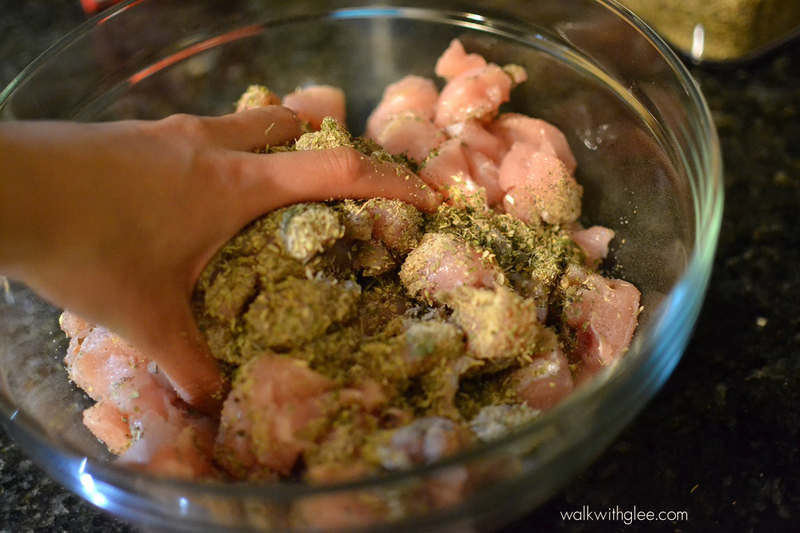 After a rather inexcusable hiatus, here is a promised post – my method of making delicious lunch meat. If you’ve read my post on the Salad Bar Refrigerator, I mention adding treats to the salad base. A good “treat” would usually still be nutritious and have protein, so typically I would either add hard boiled eggs, meat, seeds, or beans. Most of the time though, it ends up being my slow-cooked seasoned chicken. Also, contrary to what the name might suggest, you do not need a slow cooker for this! I have to admit, it is quite tempting to just buy a pack of deli meat, fully cooked sausage, or salami and be done with it, plus it tends to be more expensive when you are buying the nitrate-free variety from Whole Foods. I’d rather save it for special occasions rather than have it as my daily protein. Instead, on Sunday nights as I’m preparing to tackle a fresh week, I make this special treat for my lunch. Typically I buy a big pack of boneless chicken – breasts or thighs (thighs tend to be cheaper and in my opinion, more delicious). 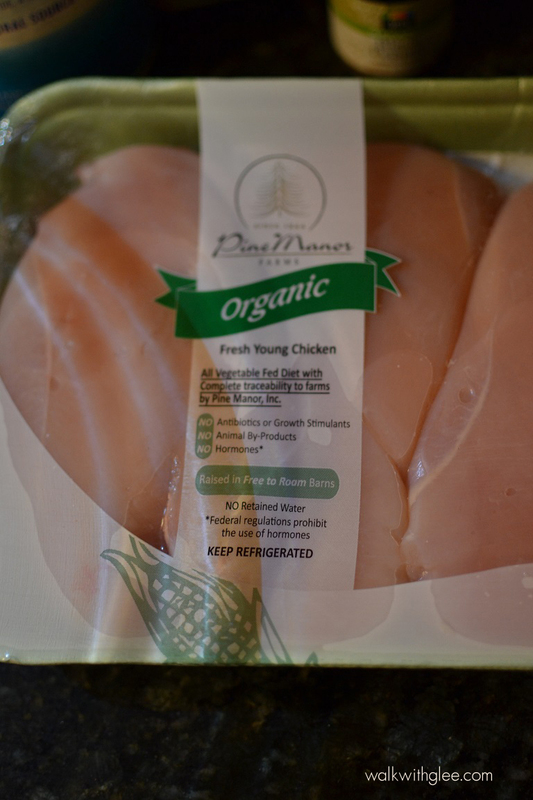 Being the undercover hippie I am, I buy value packs of Pine Manor Farms organic chicken from my neighborhood Whole Foods. You do save 10% on the already astronomical price and these packs will net you lots of chicken. 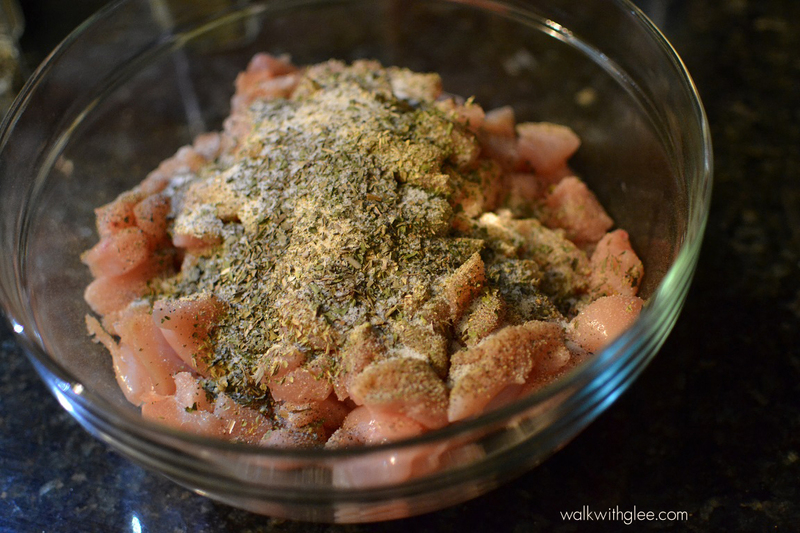 Other than chicken, you will need chicken broth, your choice of seasonings, and salt. 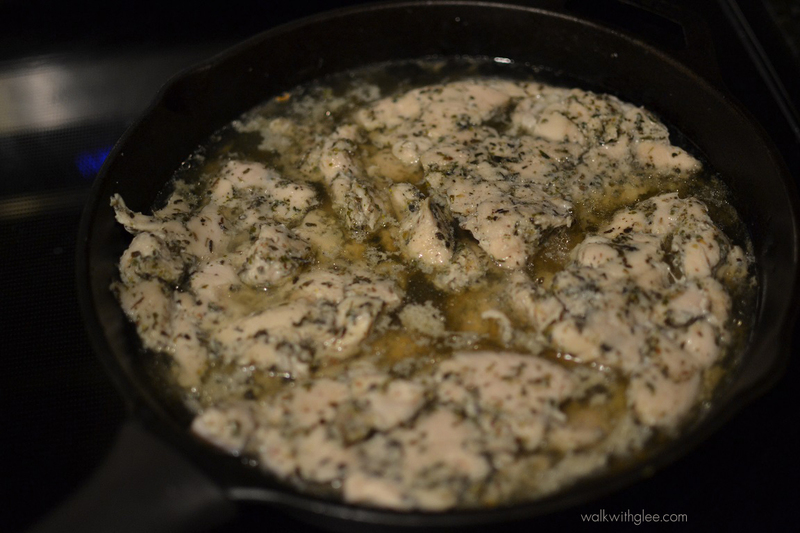 You will be cooking the chicken in a skillet (with a cover). 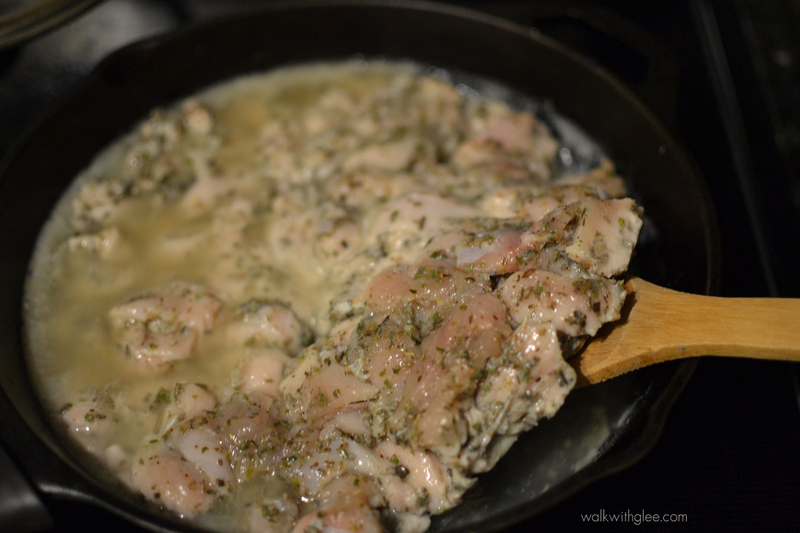 I use cast iron, but you can use a non-stick pan as well. Now that you have everything ready, here are the steps. 1. 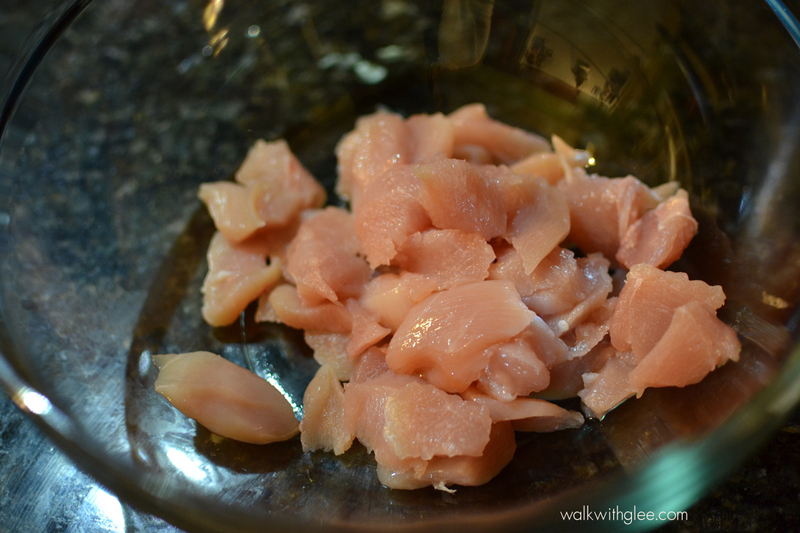 First, you’ll want to cut the chicken into small, slightly bigger than bite-sized pieces or cubes. 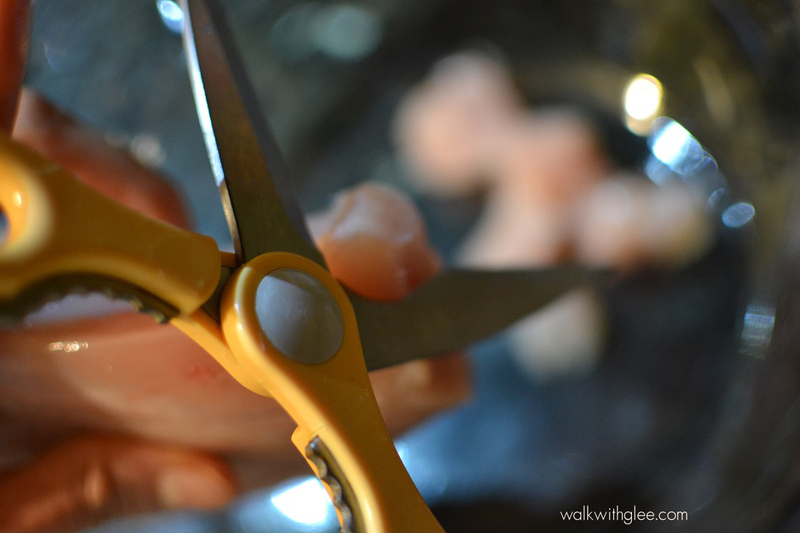 You can either use a knife and cutting board or kitchen scissors to do this. I like using kitchen scissors because it saves me from having to wash a cutting board, though you may find it to be slower than using a knife. 2. When all of your chicken is cut, you can season it. Depending on how much chicken you have and what your taste is, you can tweak it to your tastes. 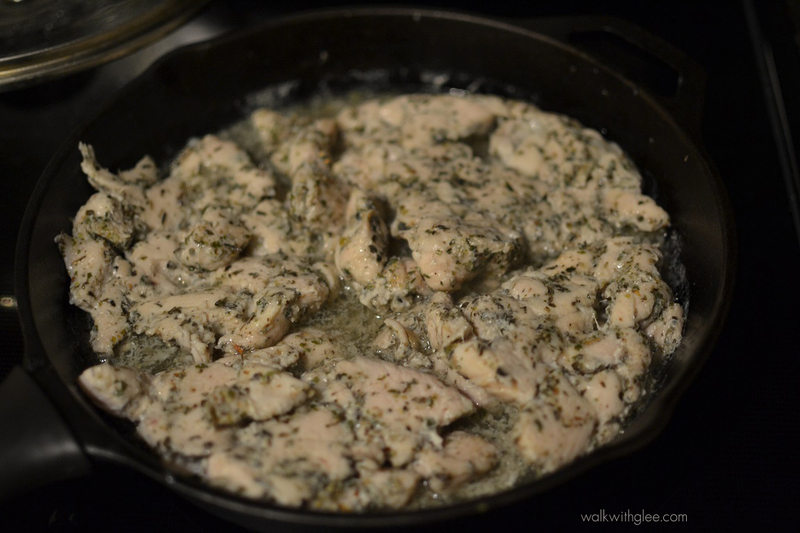 Given that I had just put in about 6 or 7 chicken breasts, I seasoned it quite generously with oregano, thyme, parsley, basil, garlic powder, black pepper, and salt. 3. 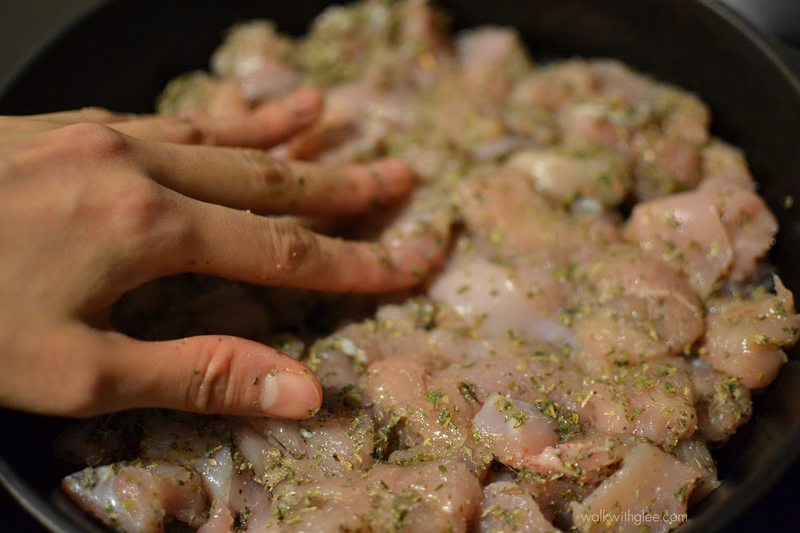 Massage the seasoning into the chicken with your hands. 4. 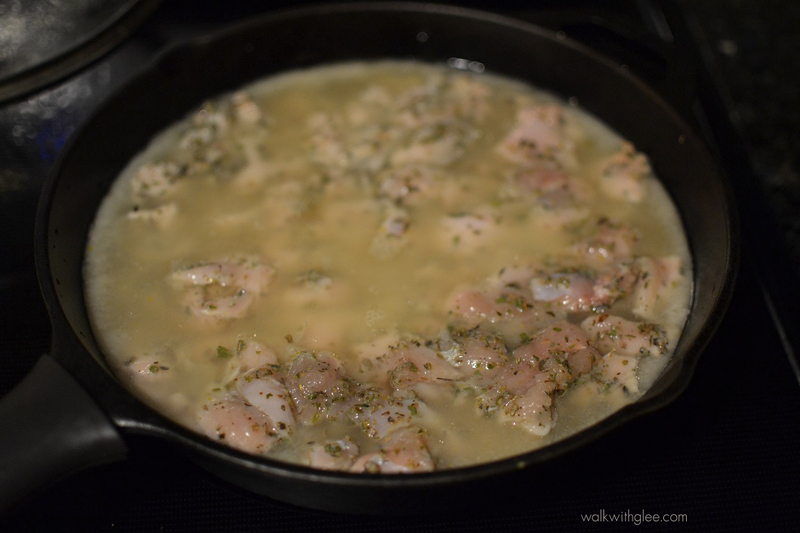 Press a single layer of chicken pieces into the bottom of the skillet with chicken pieces. 5. Pour broth over the top. Let the broth just cover the surface of the chicken. 6. 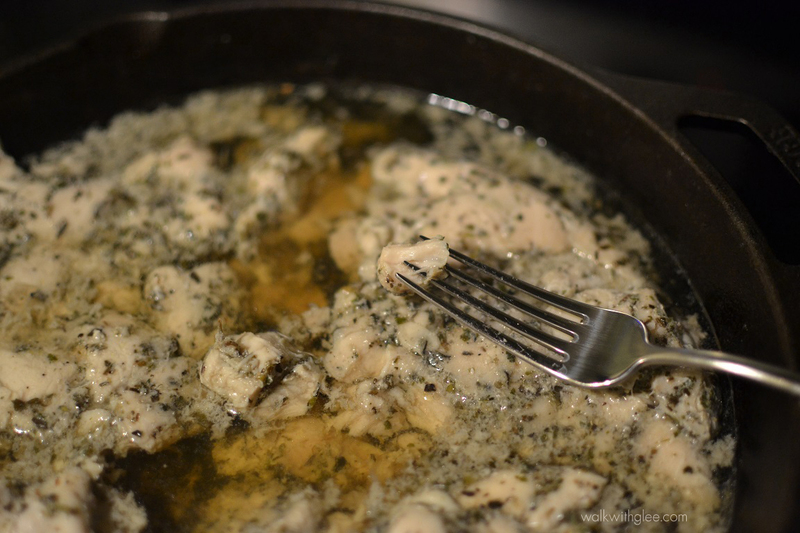 Cover the skillet to keep the moisture in, then turn the heat to medium-low. You’ll be cooking this for about an hour, but you’ll want to keep tabs on it, because every stove is different and different pans will heat more or less evenly and retain heat differently. For reference, I used my beloved Lodge cast iron pan (the most useful item in my kitchen) over a glass-ceramic cooktop. 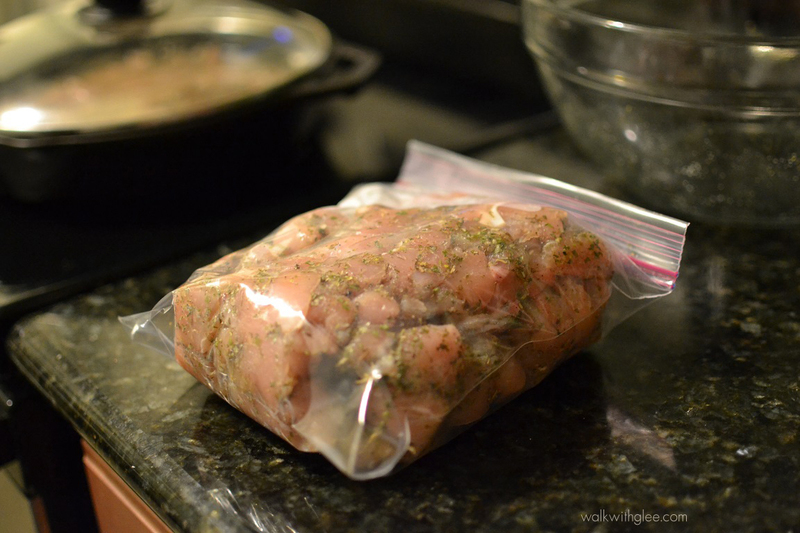 You can put the rest of the chicken in a plastic bag or freezer bag and save it for next time you need chicken. 7. You should be checking the chicken every 10-20 minutes. 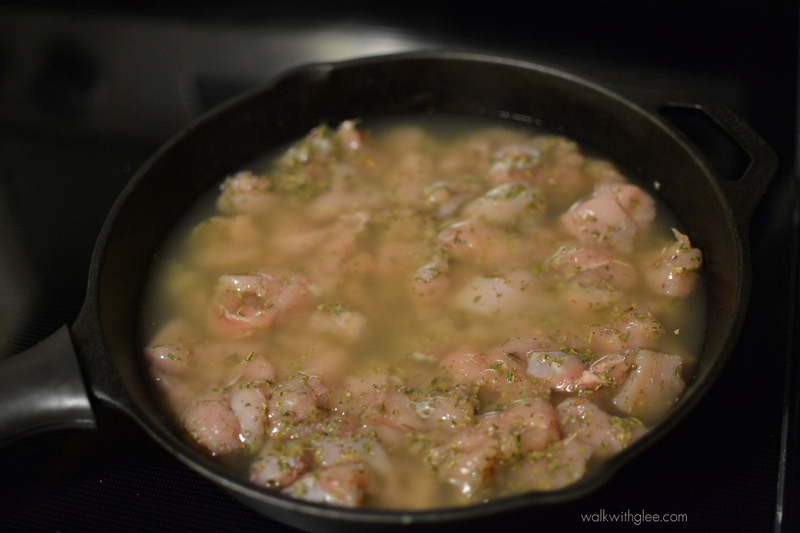 I flipped the chicken at the 30 minute mark, when the opacity of the broth starts to become a bit less cloudy and the outside of the chicken is mostly white (but still a bit pink on top). You can do this with a wooden spatula – be careful about splashing! If the broth is running low, you can add a bit more. You don’t need to submerge the chicken, but it does need to have a nice wading pool of liquid. Here is what it looks like at the 30 minute mark. 8. 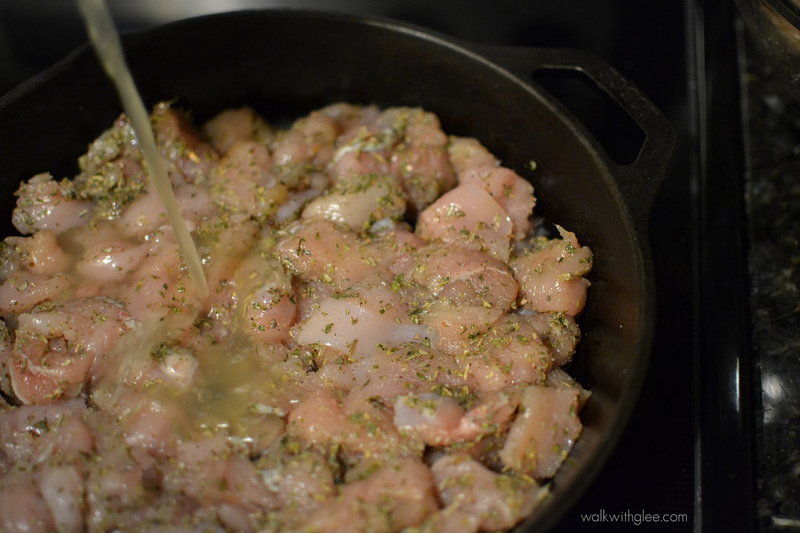 When you can see an outline of white at the bottom of the chicken pieces, it’s time to flip! The pieces will be somewhat stuck together (making it easy to flip). Be sure to cover the pan after you’re done flipping! 9. 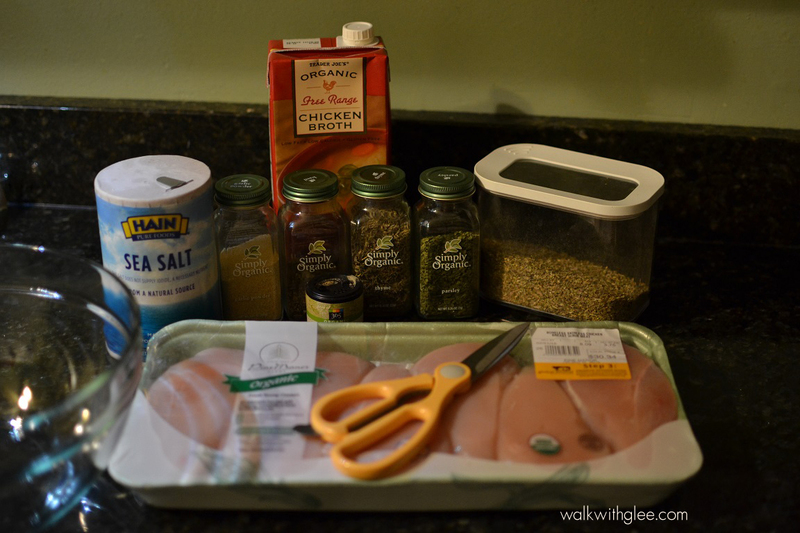 The chicken will be done between 45 and 60 minutes, depending on your stove and pan. 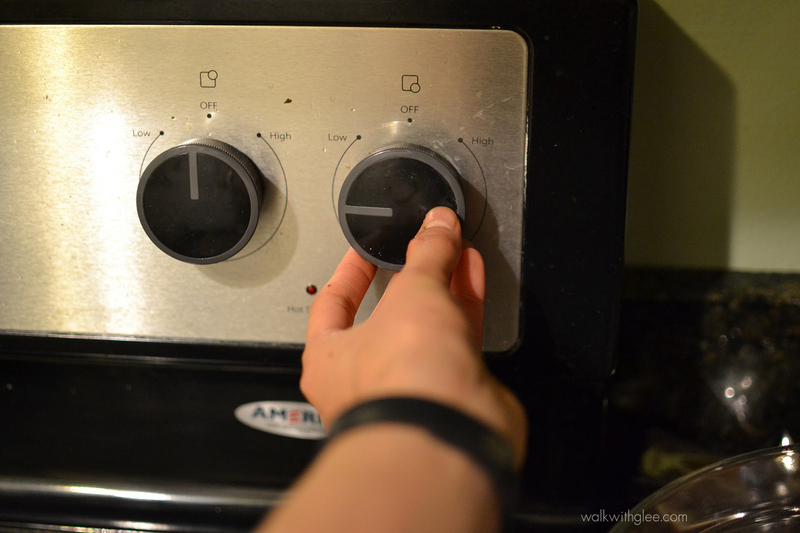 I turned off the stove at 60. 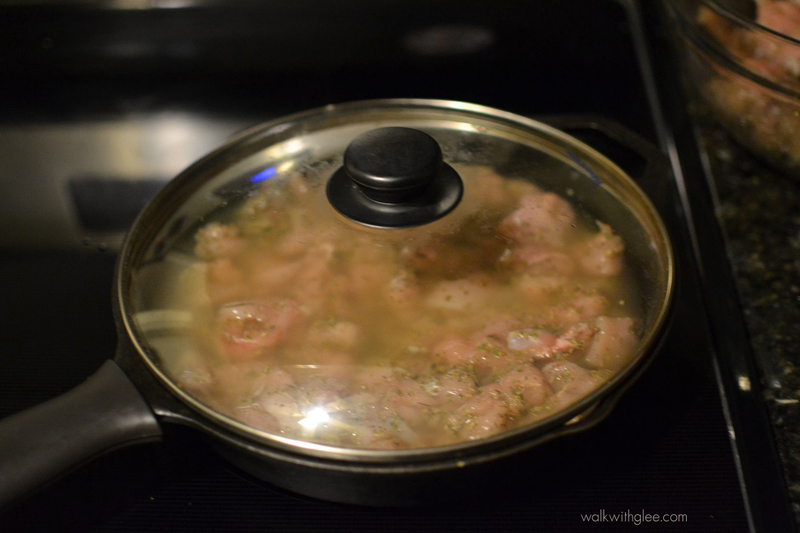 The chicken should be no longer pink inside and your broth should be clear – you should be able to see the bottom of the pan. The chicken should be tender and juicy. See? No more pink inside! 10. 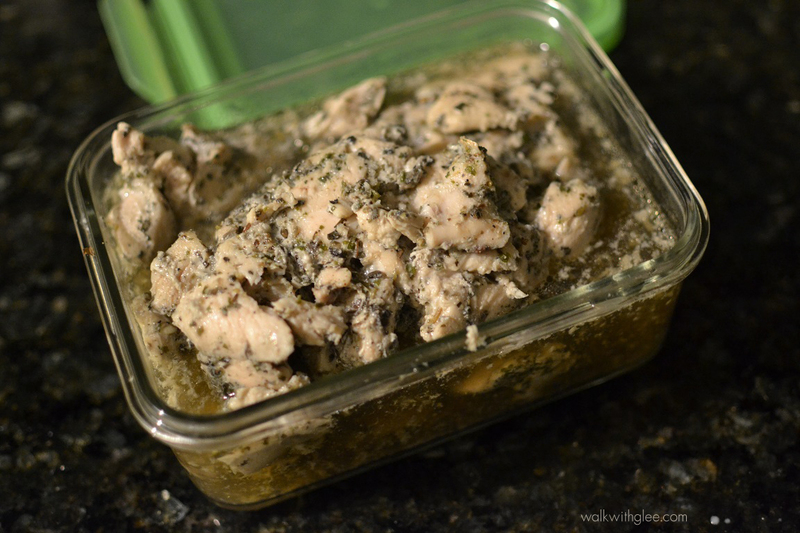 Store your chicken with the broth in a glass container in the refrigerator. Now every time you make your lunch, just add some chicken and you’ll have a chicken salad! You can even use the chicken in pasta and rice dishes for a quick meal. You’ll have a delicious savory smell of chicken wafting through your kitchen as you’re doing this which is just so heartwarming.